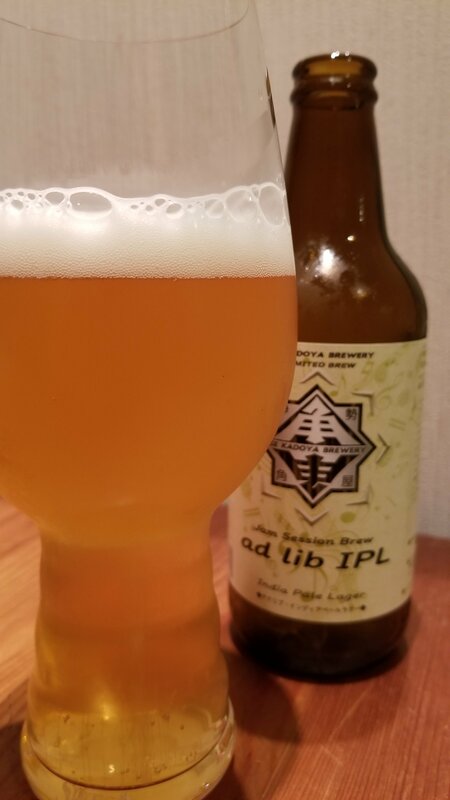 Ise Kadoya Ad Lib IPL, or to give it its full name Ise Kadoya Jam Session Brew Ad Lib IPL, is a 6% Indian Pale Lager from Ise Kadoya, based in Mie, Japan. It’s part of their limited edition range, and can be found on tap and on bottles. It’s a collaborative brew with Spring Valley Brewery with the head brewers from the Tokyo and Kyoto branches coming to Ise Kadoya to brew. It’s brewed using Galaxy and Citra hops. It has an IBU of 50. Ise Kadoya Ad Lib IPL poured out a hazy light golden straw colour with a fluffy white head on top. The head faded fast to a thin ring of bubbles around the outside of the glass. Ise Kadoya Ad Lib IPL had a sweet fruity aroma with some oranges and passion fruit coming through a biscuit base. It also had a subtle herbal layer to it as well after warming up. The crisp body was refreshing on a hot summer’s day, and the bitterness paired off well with the sweet biscuit lager base. The hops brought some fruitiness to the body, again the oranges and passion fruit being the most pronounced, along with a slight lemony edge. It was light enough to be crushable in the hot Japanese summer but flavourful enough to not be a mass produced craft beer. (See what I did there SVB?). It finished off with a bitter lemon and orange kick. Ise Kadoya Ad Lib IPL is more craft beer than most mass produced crafty beer and I wouldn’t have guessed SVB had any influence about it unless I had looked on the Ise Kadoya homepage.